Electronics companies are promoting fuel cells as an environmentally-friendly and convenient alternative to traditional lithium ion batteries. The technology promises to supplement or replace today's batteries in laptops. Instead of storing power, fuel cells generate electricity by breaking down methanol via an electrochemical process. The cells can be recharged by topping them up with methanol from a cartridge. Recently, Toshiba, Hitachi, Fujitsu, Samsung and Sanyo, among others, have shown prototypes that suggest that the technology is just around the corner. It has taken time to shrink parts such as pumps to sizes small enough for the fuel cells to be commercially acceptable. 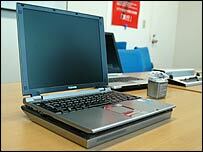 Toshiba started fuel cell development for PCs about four years ago. It is working towards commercialisation next year, said Tomoaki Arimura of Toshiba's Methanol Fuel Cell Group. 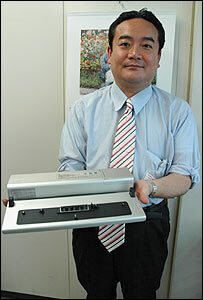 Mr Arimura gave the BBC News website a hands-on demonstration of a pre-commercial version of its laptop fuel cell. Toshiba's phase one fuel cell shows how near, but also how far, the version is from being a commercial reality. It looks like a squared-off, aluminium-cased bottle attached to a dock that wraps under a Toshiba Portege laptop. In terms of volume, it is around a litre and weighs about as much as the same measure of water. But it certainly performs well. A small, plastic, brick-shaped 100 millilitre cartridge with methanol fuel that looks like an ink-jet printer cartridge easily slots into the fuel cell body behind the laptop's screen. At the touch of the button the fuel cell instantly provides power. Toshiba says this will be enough for 10 hours of computing. A program developed by Toshiba shows exactly how much fuel is left. This is far more useful than the tiny battery mark and percentage on the toolbar. Trial tests with staff in all sorts of jobs and of all ages ended up being favourable despite initial scepticism, according to Mr Arimura. Some people fretted about the idea of methanol and liquid being so near the laptop. There were concerns about leaks. "Some people even thought there might be smoke," he said. Only a few dozen people have used the fuel cells for long periods. But some liked it so much they did not want to hand it back, he said. The fuel cell is robustly constructed, despite looking so fragile. It is designed to be about as durable as the laptop it powers. Phase one models have had to prove themselves through drop tests to show that the fuel cell does not leak and still works. "We've dropped it on its front, its back, its edges, and we've found it to be extremely strong," said Mr Arimura. Safety features extend to the fuel cartridges, which are strong and have child-resistant seals. Given the fuel, safety is a key issue. The fuel cell is loaded with sensors. When suddenly picked up and shaken, anti-tamper sensors lock down the fuel cell to avoid leaks. As it produces heat from the reaction, internal sensors make sure that it does not overheat. After about two hours of use, the fuel cell was lukewarm to the touch. The trials also highlighted the model's rough edges. The first becomes apparent as soon as it is switched on. There are small but constant whirring noises and the persistent sounds of tiny clicks made by the pump and valves. Some people may find such noises irritating. Feedback from the trials showed that some thought the shape and size of the refills inconvenient. Toshiba has been working on three key areas before commercialisation; size, noise and weight. Mr Arimura said the company was aiming to have a commercial version out in 2007. While not naming the month, Toshiba gave a partial idea of the shape of things to come with its "flat-bed" fuel cell type. This is similar to the pre-commercial phase II model that it displayed at the CES electronic show in January. The one-centimetre tablet wraps round the bottom of the company's thin and light notebook PC. It should provide about 10 hours of power. While Toshiba feels it has fully got to grips with the technology, the main question is how the company can build flexibility and innovation into the commercial models to make them appealing to customers, said Mr Arimura. Toshiba has got pump, valve and other component makers to shrink and redesign key parts to deliver the smaller sizes the company wants over the next year. 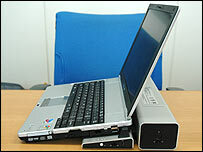 Its goal is to include the fuel cell in the body of the laptop and develop models that will produce more power.